At Yellowfin, we clearly like data. But, more so, we especially like it when we discover interesting data sets, which are visualized in a simple but powerful way. 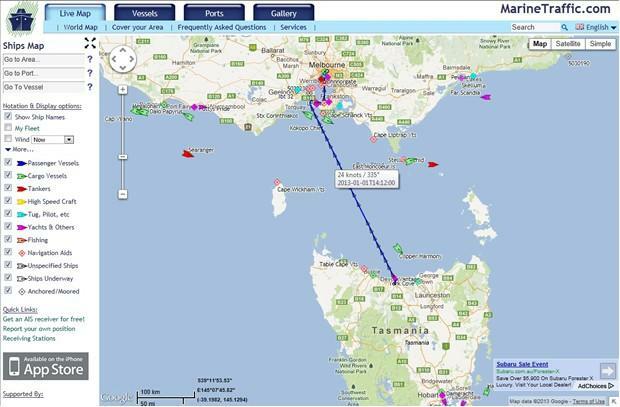 Yellowfin is based in Melbourne Australia, a bay city with a busy shipping port. With our office on the 46th floor of the Melbourne Central tower, we enjoy excellent views that stretch across the shipping docks. The site – marinetraffic.com – provides free real-time information to the public about worldwide ship movements and ports. Since December 2004, the International Maritime Organization (IMO) requires all vessels over 299GT to carry an AIS transponder. The transponder transmits their position, speed and course, among other static information, including the vessel’s name, dimensions and voyage details. The beauty of the marine traffic site is that they have used the AIS data and Google maps to create compelling data visualizations of the real-time movements of the ships carrying these transponders – a truly convincing application of Location Intelligence concepts.